Benzyl chloride is consumed in the production of benzyl alcohol (accounting for about 52% of total benzyl chloride consumption), benzyl cyanide (14%), benzyl quaternary ammonium compounds (17%), and benzyl phthalates (4%), with the remainder consumed for benzyl esters and other products. 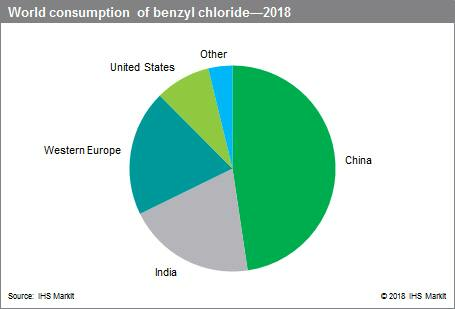 Growth in the consumption of benzyl chloride has been driven mainly by increases in China and India. Consumption in China and India will continue to grow the fastest, with expected annual growth rates of about 5.5% and 4.0%, respectively, over the next five years. The market for benzyl chloride is mature in Western Europe and demand will grow at a rate of only 1.5% annually during 2018–23. In North America, benzyl chloride consumption is expected to increase at an average rate of almost 2% per year. Demand in Central and South America is expected to grow at a similar rate, while growth is expected to be relatively stronger in Central and Eastern Europe, and the Middle East and Africa (albeit on a smaller scale). The Japanese market is expected to remain flat. Benzyl chloride consumption for the production of benzyl alcohol has increased and will continue to increase strongly in China and India. In China, benzyl alcohol is used increasingly in a variety of applications including as an epoxy resin diluent, and in perfumes, flavors, personal care, and pharmaceutical products, as well as solvents. In India, benzyl alcohol accounts for the largest benzyl chloride market and is exported primarily to Western Europe and the United States. It is also consumed domestically for pharmaceuticals, fragrances, and other uses. In Western Europe, benzyl chloride consumption for benzyl alcohol production is the largest market use. Slow growth is expected for this market in such areas as solvents, ballpoint pen inks, and chemical intermediates. There is no benzyl alcohol production from benzyl chloride in the United States or Japan. Benzyl chloride use for benzyl quaternary ammonium compounds (benzyl quats) is another major global market. In the United States, benzyl quats are expected to grow as a result of increasing usage in biocides, oil and gas applications, personal care, and other product areas. China will continue to see strong growth in the water treatment and biocides markets. Benzyl quats use in Western Europe will grow because of the water treatment and pharmaceutical industries. Other regions, such as India, Central and South America, Central and Eastern Europe, and the Middle East and Africa, will also be driven by benzyl chloride use in benzyl quats production. Benzyl chloride for benzyl cyanide production occurs mainly in China. It is expected to have only modest increases. Benzyl cyanide is a precursor to the manufacture of penicillin G; it is also used in minor amounts for pesticides, flavors, and fragrances. Benzyl chloride will continue to have growth in use for benzyl esters. In China, demand for benzyl esters will increase because of demand for fragrances. US demand for esters will grow because of perfume and cosmetics applications. Other regions such as India and Central and South America will also have growth. Future demand for benzyl chloride in the manufacture of phthalates is still unclear, as the impact and the scope of regulatory scrutiny are still difficult to evaluate. Stricter regulations are affecting the use of benzyl chloride in this application in Europe, and other regions could follow. Stricter environmental standards in China will continue to cause periodic shortages of benzyl chloride in the next few years. However, the supply shortage situation will improve as more producers improve their plants to comply with stricter environmental standards. Overall, world consumption of benzyl chloride is expected to grow at an average annual rate of 4% during 2018–23.